I don’t need to plan my social media, do I? It’s a question we hear a lot, and unfortunately, many business owners still think this is true. But social media is something that can hugely benefit from a plan and a strategy. But despite the fact that brands with a planned social media strategy are much more successful than those without one, there are still millions of businesses who don’t plan out their social activities in advance. It doesn’t have to be a big chore of a thing either. 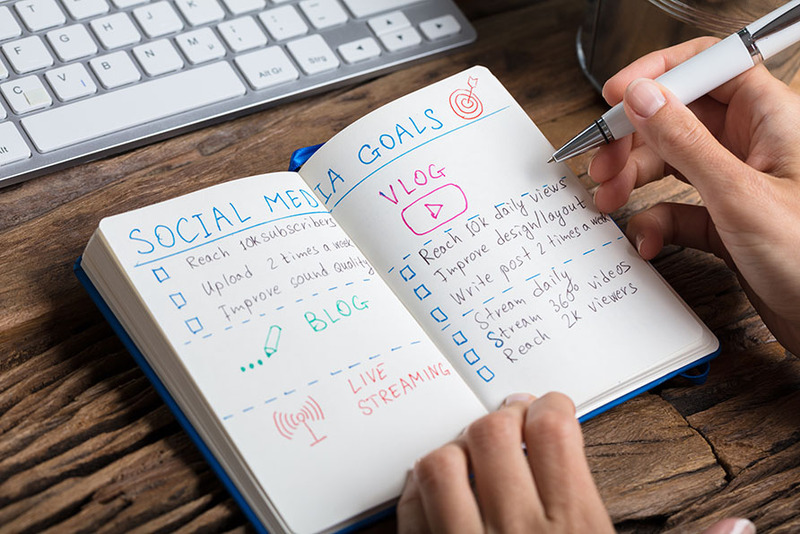 If you can plan out just 3 months of social media content at a time on something as simple as a spreadsheet, then you will find you are more consistent, your messaging is better and you can achieve a significantly higher ROI. So, our last social media resolution for you for 2019 is this – have a plan that will stick and work for you. Human beings love patterns. It’s built into our brains, and is one of the key reasons we have survived long enough to become the dominant species. Patterns are powerful, and we are drawn to things we can predict, anticipate, or see any kind of consistency in. It doesn’t have to be an obvious pattern either for our brains to understand it. So we could see something as simple as a brand posting at the same 3 times every day, or the repetition of a ‘Monday Motivation’ or ‘Friday Feeling’ post. This repetition is pleasing, and we start to look for it and engage with it. For brands, that means consistency is key. Creating a plan for your social media will help you create patterns and follow them, without any lulls or long stretches without updates. It doesn’t matter if your plan is one month long, 3 months long or a year long – the result is the same – a consistent approach to social media that will improve your chances of engagement. Social media is fast moving. Sometimes it feels like a ‘blink and you’ll miss it’ kind of marketing method. And when we scroll around 5.03 miles of screen per year, upload 8 million photos to Facebook every hour and like 3 billion posts on Instagram every day, it’s not hard to see why (you can see the live stats here). That makes a lot of things on social media very time sensitive, and difficult to keep up with. So when you’re coming up to a big holiday, product launch or competition, you want to make sure that you don’t miss a chance to talk about it on social media. If you’re creating and posting your content as it comes to you, this is exactly what will happen – you’ll miss things, get things wrong or just be unable to keep up with the competition. But with a plan in place, you know exactly what’s coming up, so you can get ahead of the game and post before your competitors do. It also means you can create and schedule ahead of time, so even if you’re really busy, you’ll never miss a moment. If your business has goals (and you do, don’t you? ), then your social media efforts should be focused on achieving those goals. The problem is, unless you’ve worked out how you will achieve that goal and actually written it down, it can be difficult to work out what you need to do to hit your goal. Without a plan, your social media will probably be disparate and a bit random. A plan means you can create content that matches your business goals. This usually comes in the form of a single campaign, across multiple channels. So, for example, if one of your goals is to sell spaces on a workshop in March, you can use social media to promote the spaces across a variety of platforms, with a series of offers, artwork or giveaways to help drive interest. Plans help you to organise your efforts and make sure you’re saying the right things at the right times, in the right places, while not repeating yourself. Following on from that, a good plan also helps you build the foundations for a strong and effective brand presence online. Effective branding has never been more important in a market that’s so saturated with products and services, and so the challenge is to make yours stand out from all the others. Social media is a great way to do this. It gives you an opportunity to really let your personality shine through the white noise and show your customers why you’re different. But if you do this without a plan, it can feel a little forced, insincere or just not there at all. A good plan will help you to plan out your social interactions, find the direction you want to take and choose your style, tone and overall approach moving forward. Ultimately, your social plan ends up becoming the thing that ‘steers the ship’ online. When your business was first started, you probably created some form of client avatar. This helps you understand who your ideal customer is, where they hang out and how you would reach them. This knowledge is essential for your business, and social media can help you work out who your audience actually is, and what they are responding to. Thanks to the wide range of in-built analytics tools in almost all social media platforms, you can develop a deeper understanding of your audience. You can then use that information to create and plan content that would appeal to them specifically, significantly improving engagement online. Armed with this knowledge, you can also develop deeper relationships with your audience, which leads to a more comprehensive and targeted approach to marketing that can help improve the way you approach your whole sales funnel. And that’s it for this series! We hope you’ve enjoyed our three-part series on social media resolutions for 2019. As always, if you have any questions about any of the resolutions we’ve discussed, or just want to chat through some ideas, we’d love to hear from you. At Orbital Media, we work with business owners to create tailored social media plans for their brand, and we can even implement them for you if you just don’t have the time. To find out more, just get in touch with the team today.